Awhile ago I began using Nik software Silver Efex Pro to convert my black and white images. I was using Photoshop for conversions and was never really quite happy with the results. Perhaps because I love working in the darkroom, I always compare analog with digital. There is a richness and depth to the blacks of a silver gelatin print that I am always trying to replicate with digital. I have had to relinquish working in the darkroom as it’s pretty impossible to keep chemistry the right temperature in an Arizona summer. So digital it is. I think Nik has done a superb job with their conversion software. Silver Efex Pro (the current version is Silver Efex Pro 2) offers more local and global control with your photographs. The software allows you to determine a control point and make adjustments to a selected area of your photograph. No more laborious masking then burning and dodging in Photoshop. Several well-placed click and sliders and you’re done. It also offers different toning colors and film choices. There is a free trial you can download to try it out, and no, I’m not affiliated with Nik but I really like their software and their iPad photo-editing app, Snapseed. I had the good fortune of taking a darkroom workshop with John Sexton a few years ago. 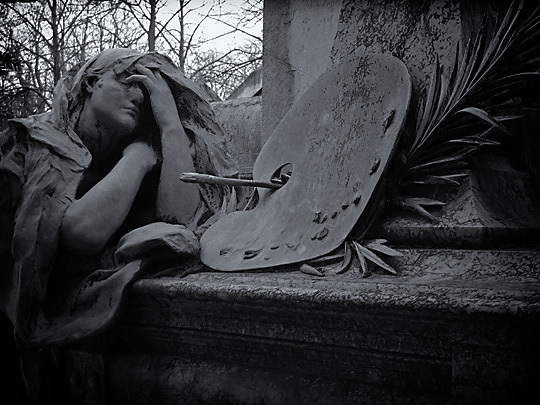 One of my classmates lives in Paris and brought in a black and white photograph of a beautiful grave statuary that he took in Pére Lachaise cemetery. That image haunted me (no pun intended) for years. I visited Pére Lachaise a couple of years ago and searched that giant necropolis until the guard led me out at closing time. 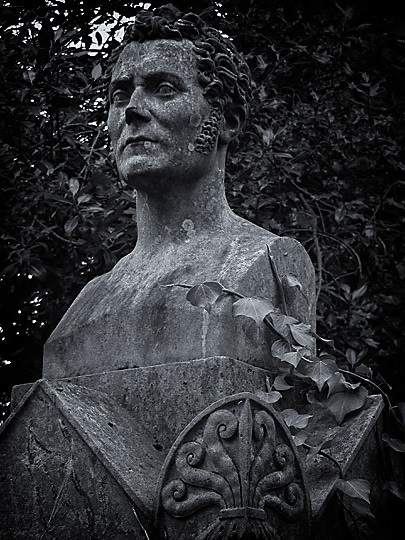 I think I saw every grave there except the one for which I was searching. 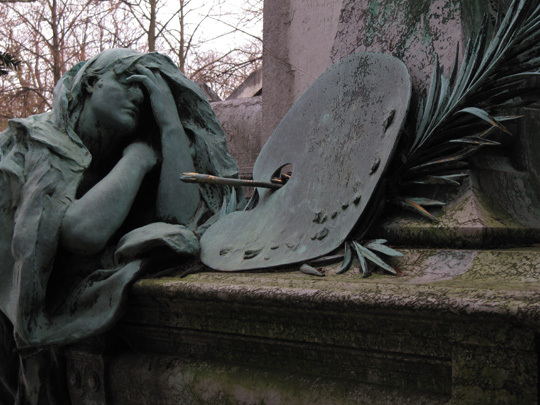 Finally, through a Google search I found that the grave and statue belonged to a mural painter, Paul Baudry. Two of his colleagues had an elaborate monument made for his gravesite. 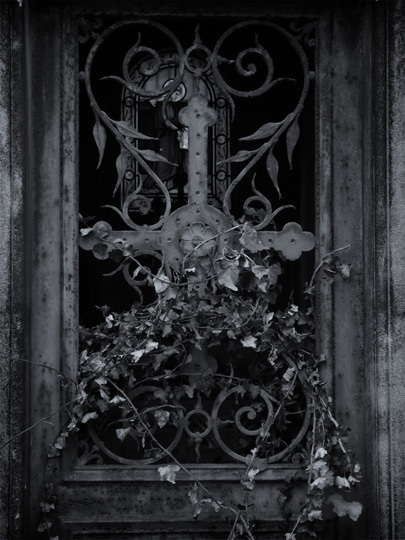 It was the first grave I visited when I returned to Pére Lachaise last March. Perhaps it appeals to my soul as the woman with the artist palette appears to be lamenting the work that never becomes realized. I’m happy I don’t have to obsess any longer trying to locate her. I usually tone my darkroom prints with selenium to cool my shadows, and the software has three variations of a selenium tone effect. I have yet to try a duotone with the software but that’s my next experiment: a copper-blue duotone that’s so difficult to achieve in the darkroom. I will post images if successful. I am a photographer, printmaker, and painter currently residing in Dallas, TX. I write and podcast app reviews for MyMac.com and 3 Geeky Ladies. If I'm not working with art apps on my iPhone or iPad, I'm out collecting objects to draw and paint. When I'm not in the studio, I'm attending to my other love: cooking and baking bread.